Last year my husband and I went to the Lexington Sheep and Fiber Festival at Masterson Station Park. The morning had barely started when we decided this was going to happen every year. This year wasn't as perfect weather, but we still had fun. We got to try some kettle corn, and bbq goat from vendors. Saw the Haus of yarn van, and many fiber animals. Hope you can join us next year! I love the skein winder in this photo, great way to save space when winding balls. Sorry about the poor quality, it was raining! I have also got a couple finished objects to share. These are my mega stash buster rugs. I used up to ten strands at a time for a plushy comfy rug. That makes playing with all the colors of my scrap stash so fun! Such a one more round project! have to see what the next color is going to look like. More scraps from some of my favorite projects, I've wanted to make this project for a few years. Added some more booklets for sale to my Ravelry library, please check them out. I can't lower the prices much, but if you buy more than one item you will save a lot on shipping. 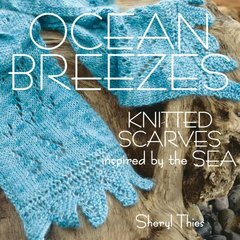 Ocean Breezes Knitted Scarves Inspired by the Sea by Sheryl Thies remains ones of my favorite books. I have knit 4 scarves to completion, and still love looking through it and matching up my yarn to other pattern. One of the nice things about the books is many of the yarns are easily available. All patterns include the yardage and fiber of yarns used, making substitution easier. This is a book of scarves, so most have straight forward construction. Any constructions that are new to you will be much simpler to learn in a smaller project like these scarves. These aren't all beginner projects, but some are. They will provide inspiration to more experienced knitters as well. I still want to knit Turtle Tracks. My Scalloped Shells was a case of wrong fiber for the pattern. Maybe someday I will get to reknit it. With a very brief introduction and a few hints to substituting yarns, this book is mostly about the patterns. You will need to be able to knit lace, cables, and graft. Or have another resource for learning the skills you need. A couple of the patterns are just knit and purl, they can give you the confidence to knit more of these scarves. One thing that can make these patterns more challenging is the lack of charts for the stitch patterns. Available on Amazon in softcover, and Martingale as a pdf download. I am an Amazon affliate, and your purchase through this link helps support this blog. Errata are available at the Martingale website for the Mermaid's Mesh scarf, my copy already had the correction. Check out my library on Ravelry. Suggest a review, give your review, or purchase one of the many books available for destash. Tomorrow I get to visit the sixth annual Lexington Sheep and Fiber Festival. If it is anywhere near as exciting as last year, I will have lots to share with you. Look for pictures of sheep, yarn, fleece and fiber. Tracey Schuh Owner of Interlacements yarn sent me a new yarn. It is Lacey, a two-ply super fine merino, with 930 yards to the skein. What can you knit with this yardage? A sleeveless top in a variety of sizes, or a wide variety of shawls among other thing. Two- ply yarn shows off lace wonderfully, and Chloe's Heart was designed with this in mind. Is a cables and lace pattern from Annie Malone, that will challenge you every row. One tester commented: "A fairly involved lace scarf. This is not an easy pattern nor is it intuitive. It is challenging and the result may well be worth the work." Most right side rows are a combination of lace, cables, twisted stitches, knits and purls. The wrong side rows are knits and purls, and purls through the back loop. The stitch pattern is charted and written for the scarf version. The wider stole is charted only. There is also a separate download for a 2 page chart in a larger format. This yarn was nice to work with, and got just a bit softer after blocking. It is holding the block nicely, as you can see by the points. Stitch definition was good for the lace and knit and purl sections. The larger cables showed up well enough for this pattern, but at this gauge an allover cable pattern would be flat and not highly visible. The 2 ply construction and occasional slubs combine to make this knit looking rather rustic. Have you used Lacey by Interlacements? What yarn would you use for Chloe's Heart? After thinking about what to post today, I realized what I really wanted to do was introduce myself. My name is Rachel, though you will find me as 100Creations on most social media. That username is frequently available. When I first started online I worked on so many different crafts I wanted a name that reflected that. I wasn't a knitter yet, hadn't discovered crochet either. I had learned how to bead, and wire metal work. Cross-stitch, embroidery, sewing, and many other crafts came first. I married in 2004, and discovered crochet that same year. My mom had saved the stitch by stitch magazines she had received, and passed them on to me. They have many crafts included, but start from the very basics and progress through making your own patterns and advanced items. I made granny squares with scraps of yarn I had (probably from plastic canvas). Then for some reason didn't crochet for awhile. Later I picked it up again, making more granny squares. Either I picked the wrong hook, or my gauge really changed. The new squares matched the old in number of rounds, but five of the old blocks matched four of the new. After figuring this out, I was able to join all the blocks to make a afghan I still have. It is a classic granny square blanket with scrap center rounds, then a final black round bordering all the blocks. I can't remember exactly my next project, but for little while I started crocheting anything I could. I still had no real knowledge of gauge, just that it was really important to match the pattern. I also had no idea what weight of yarn meant. I figured if you could crochet the yarn tight enough to make gauge that was the goal. Thus the sweater that could have stood on its own (no pictures available). Some projects weren't complete failures. I crocheted another afghan using this pattern, with blue strips for the hearts and white for the diamonds. I did the math for a skirt and finished most of it. That pattern still needs to be finished, but the idea was sound. So I really started improvising quickly. Ravelry wasn't around then, or who knows what would have happened. Thus began my yarn and pattern obsession (there really is no other word for it). My pattern obsession lead me down another road. So many pattern books would have crochet patterns, but were mostly knit patterns. Or even mostly crochet patterns, but I really liked the knit patterns they included. My Grandma had tried to teach me how to knit. After I begged and begged! But I had lost interest after deciding it was to hard. That may have been because I had in my head that the only proper way to knit was to pull the stitch through, then pull the yarn (so it couldn't go anywhere, I guess), making the it very difficult to move the yarn across the needle. Then to try to draw the yarn through that stitch to make another was hard work. My first project was a scarf. My practical Grandma made sure it would match my coat, so it was in stripes of white and tan. I quickly decided that wasn't difficult enough or something. I wanted to make a vest. Not sure why Grandma let me start one project when I hadn't even finished the first. I choose white for the background, and four? other colors for striped bands. Stripes again! I was positive knitting just one color would be to boring. I knit away on that, checking the length frequently. Not by measuring tape, but by holding it up until I decided it was time to start the neck. Again, grandma must not have been immediately available because I didn't form the neck by decreasing. I had learned to cast off and decided that was the proper way to 'get rid' of stitches. This would have worked, had I ever finished the knitting. I never even finished the half front I started on. So having decided I couldn't knit, crochet became my main yarn craft. But so many people knit, surely it wasn't that hard! Thus learning knitting came back into my life. That is a journey for another day. How did you learn to knit/crochet? Do you do any other crafts? This was one of my first crochet projects: (so glad I already had a digital camera, even if it and I weren't very good at taking pictures). Note 'quality control' daisy checking it out.